Very happy to be a finalist in the 2018 Doug Moran National Portrait Prize with one part of my multi-media portrait of Tony Bond OAM (see full page). Exhibition runs from 2 November to 16 December 2018, Juniper Hall Paddington. Very happy experience judging the Black Swan Prize for Portraiture with Dr Stefano Carboni (director AGWA) and Joanna Gilmour (curator NPG). In 2009-10 I was so fortunate to spend some time with Gundungurra elders Aunty Mary King and Uncle Merv Cooper (both now passed). For me theirs is the great story of the Blue Mountains, hearing their old stories and yarns of the Gully in Katoomba, and the even older ones from the surrounding valleys. If I was to see faces in our incredible escarpments up here it would be these. I guess these are also about what is glorious in an elder person, how the fruition of an entire life and the explanation/teaching of it can be written in the face and the body, without even saying anything. I will be showing these for the first time as part of Kedumba Connections, a satellite show of Kedumba trustees works held in conjunction with the 2018 Kedumba Drawing Award, opens 20 October to 2 December, Orange Regional Gallery. Big thank yous to Uncle David King, Aunty Merle Williams and Aunty Sharyn Halls. 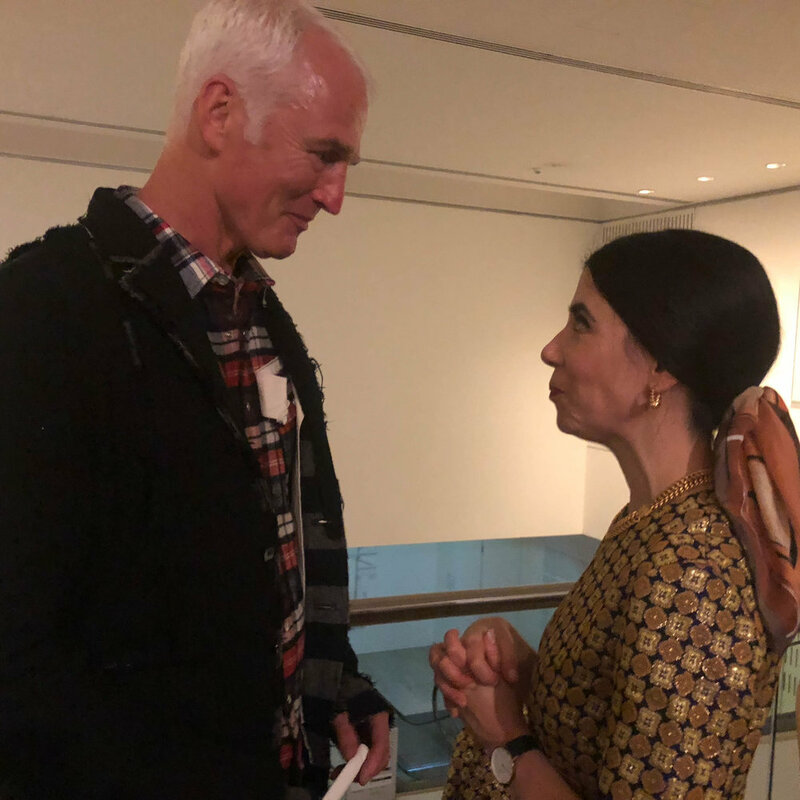 Photos from the artists preview with special guests in the Archibald gallery, before the exhibition was later opened upstairs by Gladys Berejiklian, Art Gallery of New South Wales. John McDonald's review, published May 11 at johnmcdonald.net.au and in the Sydney Morning Herald Spectrum. 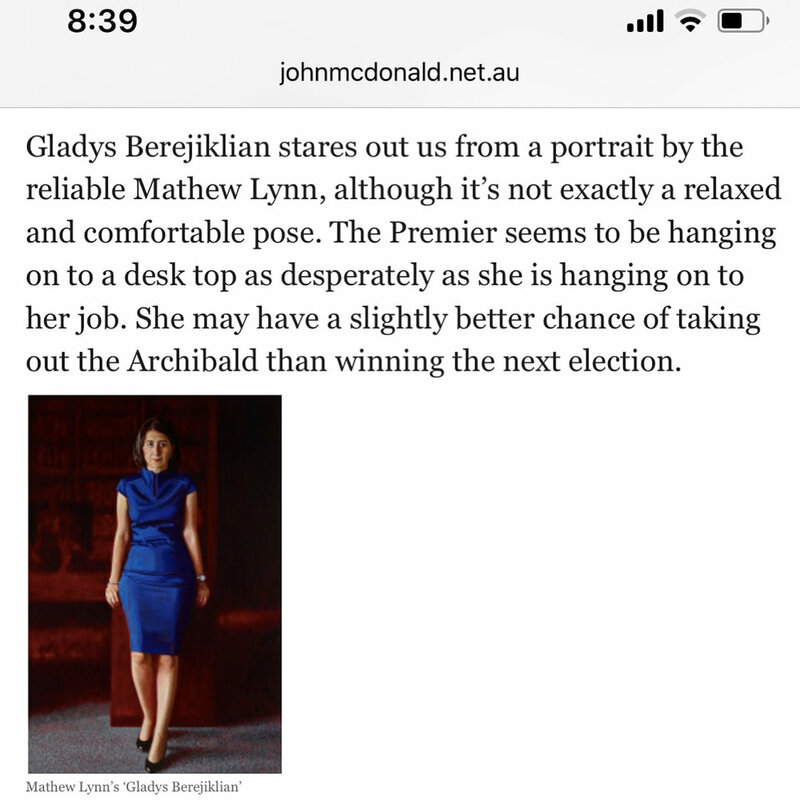 Mathew Lynn’s portrait of New South Wales Premier Gladys Berejiklian represents his 15th time as an Archibald finalist. He was highly commended and won the People’s Choice award in 1997, and he won the Packing Room Prize in 2013. ‘I didn’t have any particular thing I wanted to say about Gladys, in fact I was after the opposite. If anything, I wanted to suggest the unknowable and enigmatic, to convey that sense that we are unable to work out exactly what she is thinking. It was perhaps more about working intuitively and succinctly with each other, reflecting her day-to-day existence,’ says Lynn, who lives and works between Sydney and the Blue Mountains. ‘I wanted to create a kind of person/body space that is open-ended and capable of holding each viewer’s own thoughts, sensations or personal knowledge of Gladys,’ he adds. A work exploring one of Tony Bond’s key curatorial themes, and a place where he and I intersect - the active participant/embodied experience and meditation/meditative states. Moving away from the notion of artist and artwork as objective, detached, universal phenomena, Bond has always sought to highlight an art that explores and understands the active role played by an involved 'experiencer', not so much by a detached 'viewer', an art that also relies less narrowly on 'representation' alone. Here also, the lines become blurred as to what the actual nature of the 'artist' is. So much so that this 'experiencer' is actually, in equal regard, the artist - through their unique operation of a work and what they bring to it, and ultimately representative of the only true way we experience phenomena, from nowhere else but our own mind. It is for this reason that this work avoids a single viewpoint, combining a reference to the grand portraiture of the past (frozen in time), with traces of actual experience referenced within the video, but no more 'real' than the painting. It is Lynn's contention that when we cross this threshold into experience, we naturally and unavoidably forego the entire apparatus of the objective and the universal, and therefore neither Mortality nor Immortality has any foundation whatsoever. This work also attempts to avoid the completion, neatness and finality of a finished work concerned primarily with 'representation'. It combines two 'sketches' of differing viewpoints, neither one being more truthful than the other, with the intention of opening up the possibility (for the viewer/experiencer) of this constant and unfolding state of flux. There are few more capable portraitists in Australia than Mathew Lynn, who seems to be bounced in and out of the Archibald depending on what quota of relatively traditional painters they are allowing. This year, Paul Newton, Robert and Tsering Hannaford made the cut, and Lynn missed out, but his portrait of curator, Franchesca Cubillo, is one of the most striking pictures in this year’s Refusés. It may seem as if Lynn has never gotten over Velázquez, but what’s wrong with that?